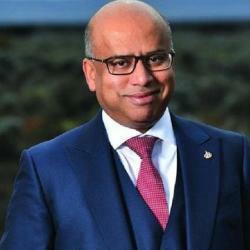 Simec Zen Energy, controlled by billionaire Sanjeev Gupta, is considering an Australian sharemarket listing as it seeks capital to become a major renewables energy operator with a $US1 billion ($1.4bn) pipeline of projects. A year after the steel magnate bought a majority stake in the Ross Garnaut-led clean energy and battery storage business, the company has revealed it may look at an IPO after pledging to bring one gigawatt of renewables into the grid from South Australia. “At some point Simec Zen is going to have to access capital and it could well be via a market-based capital raising,” Simec Zen chief executive Marc Barrington told The Australian, saying a float was one option it would consider. The revelation of a potential float of Simec Zen follows a plan unveiled by Mr Gupta to target an IPO of part of his “green steel” recycling business in Australia in the first half of 2019, closely followed by a separate US listing incorporating its North American steel assets. The entrepreneur conceded to The Australian earlier this month he needed to improve transparency over parts of his international empire as underwriters seek an explanation over the structure of his sprawling business, including a string of investments in Australia. Simec Zen also said it would submit a proposal for the federal government’s plan to bankroll new reliable power generation in the national electricity market. Power operators have been asked to propose projects by January 23 as part of a four-year scheme to be launched today aimed at mending a “market failure” and breaking up the stranglehold of the big three ‘gentailers’ AGL Energy, Origin Energy and EnergyAustralia. The first phase of the program, which starts in the first quarter of 2019, will offer quickfire financing options allowing the government to move quickly on upgrades to existing generation. Subsequent phases involving more sizeable investments and large chunks of supply will trigger additional ­financing mechanisms that are yet to be detailed. Simec Zen will include its Cultana solar farm project in South Australia’s Upper Spencer Gulf, along with a new giant battery to be installed in the state’s Port Augusta, in its pitch to Energy Minister Angus Taylor. “One thing that will help achieve globally competitive prices is the underwriting guarantee that has come out of Angus Taylor’s office,” Mr Barrington said. Mr Gupta launched a $1bn, one gigawatt renewable energy scheme in South Australia’s mid-north in August. It includes the Cultana solar farm, lithium-ion battery, a cogeneration plant to power the Whyalla steelworks using waste gas and pumped hydro facilities in the Middleback Ranges. GFG’s acquisition of Whyalla and Arrium’s iron ore mines makes it one of Australia’s biggest power users. Zen partnered with Simec to deliver cheaper, more reliable and environ­mentally sustainable energy for Simec’s mining operations in South Australia and Liberty OneSteel’s operations in South Australia, Victoria, NSW, Queensland and Western Australia acquired in the Arrium takeover. GFG Alliance, headed by British billionaire Mr Gupta and backed by his father, Indian tycoon Parduman Gupta, bought a 50.1 per cent stake in Adelaide-based Zen in September last year.